The use of expanded shale and clay was pioneered as an infield conditioner on a single ball field in Texas in 1989. 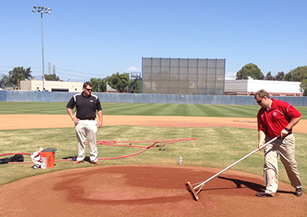 The result was immediate — a faster drying, smoother, safer, more consistent playing surface. Soon afterward the Diamond Pro brand was born. Today Diamond Pro is a complete line of professional groundskeeping products that satisfy a wide variety of groundskeeping needs. With its superior products and outstanding customer service, Diamond Pro is currently recommended by many professional sports turf managers, parks and recreation directors, and coaches nationwide. Incorporating Diamond Pro into our infield has helped in the everyday maintenance and in building a reputation as one of the best infields in baseball. Diamond Pro’s products and technical support have helped us to meet the demands of MLB spring training, Minor League, college and high school games. Rain or shine, Double Play Infield Conditioner allows us to maintain a consistent, quality infield surface. Diamond Pro's service and quality are #1. They are a one-stop shop for my groundskeeping needs.